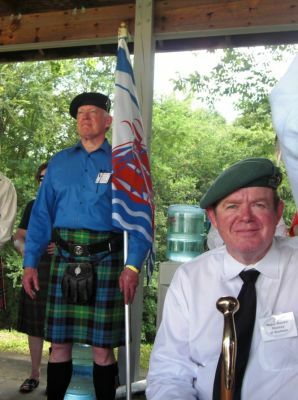 Society of Scottish Armigers (SSA) in the stands during the Glasgow Highland Games Opening Ceremonies: In the foreground: MAJ Randal Massey of Dunham, USA (Ret.) and behind LCDR John Glynn of Glynstewart, USN (Ret. ), SSA Secretary, holding the Society of Scottish Armigers Banner.